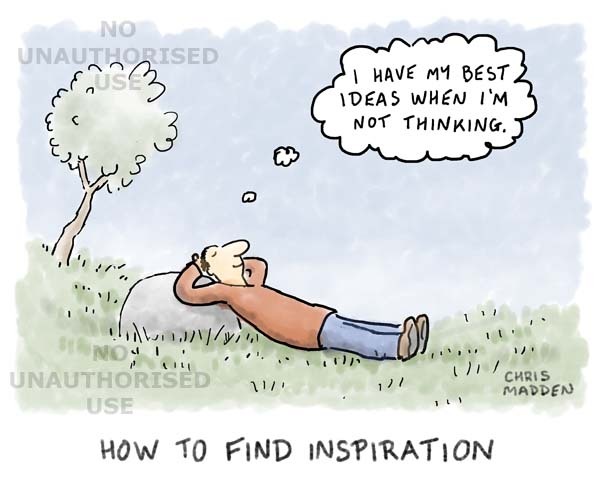 A person finding that inspiration comes most easily by relaxing and not thinking too hard. A cartoon about cognition, thought processes, the nature of creativity, inspiration, ideas, the creative process. 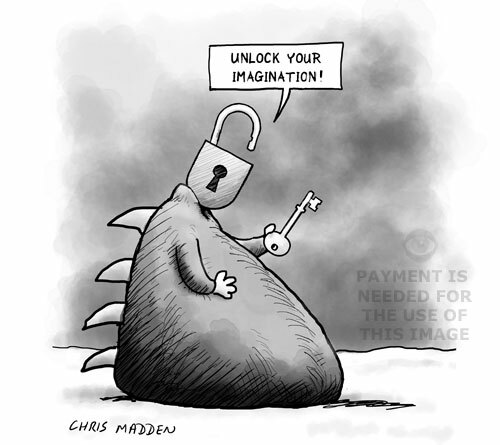 A bizarre or surrealist image showing a person or imaginary creature with a head in the form of a padlock. The person is holding a key and is saying “Unlock your imagination!”. 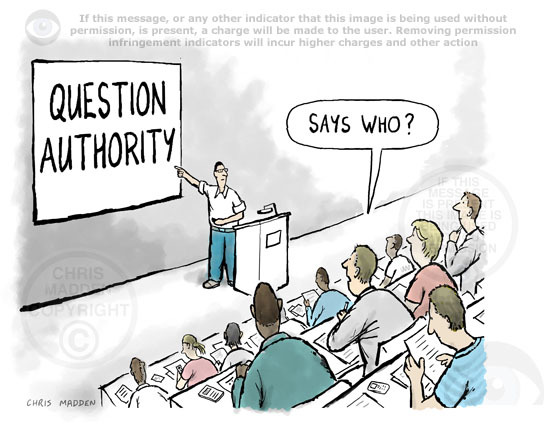 The cartoon has uses as an illustration in art education or in areas of philosophy or psychology. Cartoon showing small children in a nursery class practicing drawing and painting (or colouring-in). The teacher is helping the children to learn how to draw and paint. 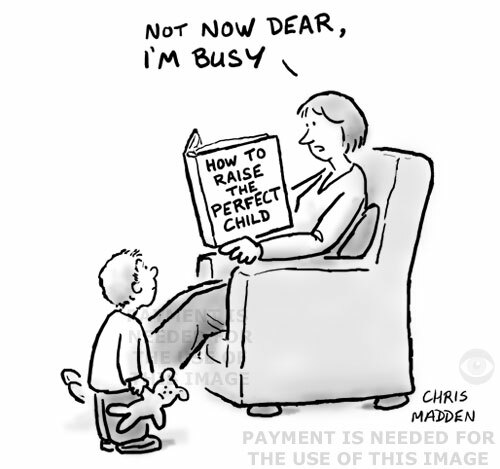 The cartoon is about child development and children’s artistic development. It is also about adults’ expectations of what children should achieve and about educational methods and standards. 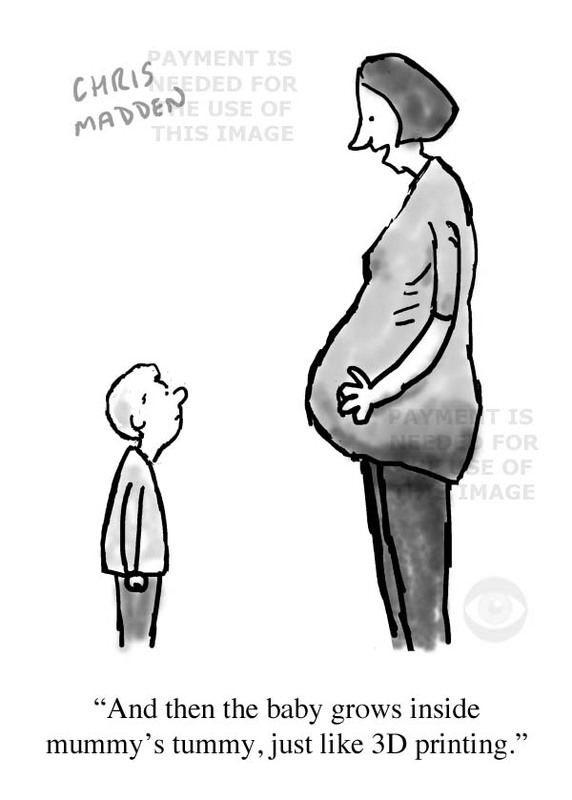 The child in the cartoon is obviously very talented, drawing a very sophisticated likeness of a person (her mother), however the teacher is being very prescriptive in her teaching methods and is encouraging the child to conform to the lower expectations of the standard that children of her age normally attain – in other words drawing a stick person with a big round head. 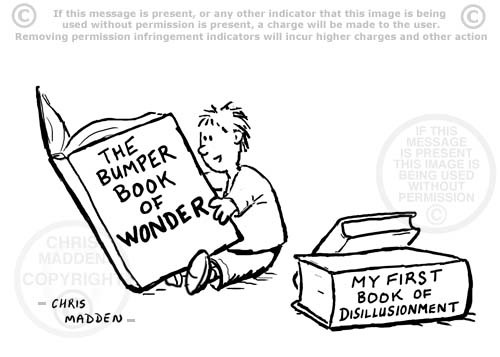 A philosophy cartoon showing a child reading a book titled “My First Book of Existentialism”. The philosophical theory of existentialism is usually associated with Jean Paul Sartre. The humour in the illustration is that an elementary book at the level illustrated in the cartoon is far too basic to explain the theory underlying existentialism (or any other philosophical theory for that matter). 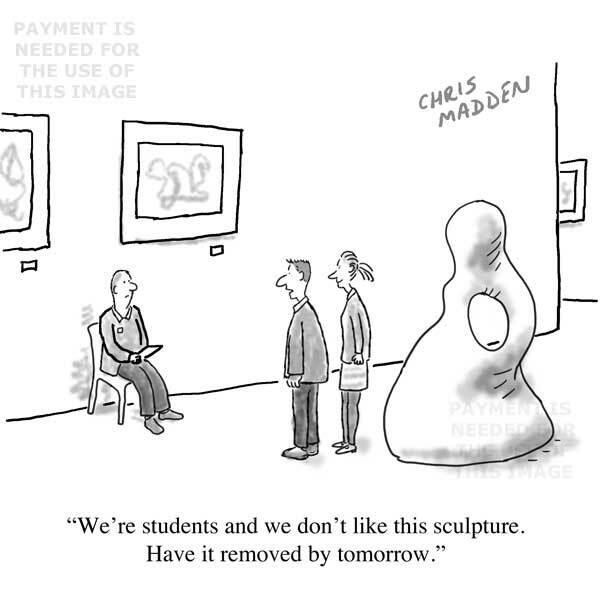 The cartoon also hints at the possibility that some philosophical concepts are more basic than is sometimes thought – and that some philosophies are probably flawed due to fundamental errors due to the limitations of the human brain to grasp concepts. 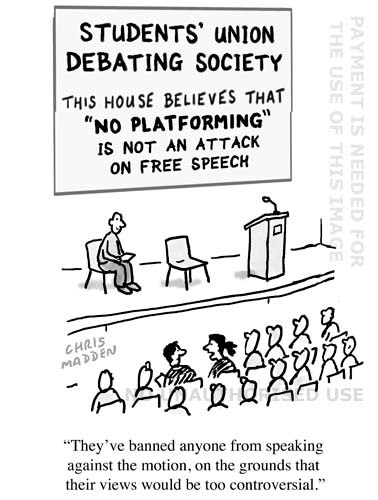 A cartoon about philosophy, existentialism, existentialist philosophy, philosophical theory. 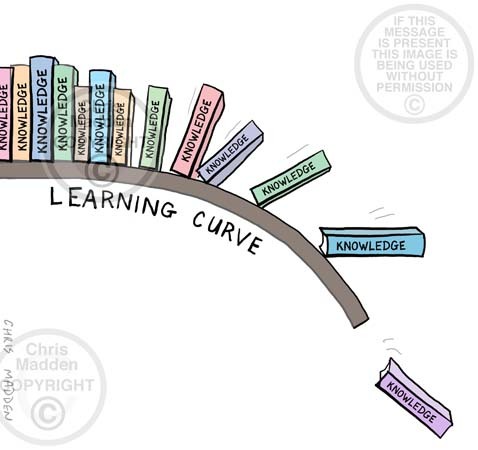 A cartoon about growing up and loss of innocence, acquisition of knowledge, epistomology, epistemology. 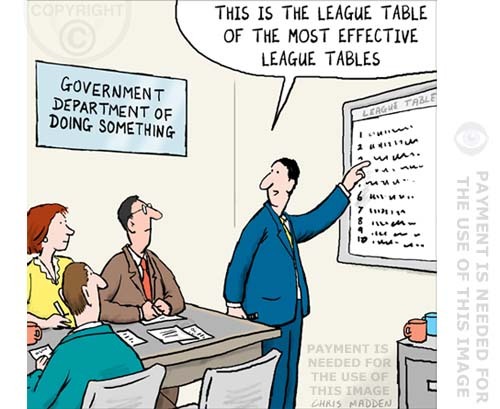 Cartoon.The cartoon deals with a topic that is discussed in the book “Eats, Shoots and Leaves” by Lynne Truss. A cartoon about linguistics, language, misuse of grammar, grammatical errors, punctuation mistakes. The illustration is about freeing the imagination or liberating the mind to be creative, or on unleashing creativity. It is an image to convey the link between creativity and thought processes.